What Do You Talk To Your Listing Agent About After 3 Years Of Being On The Market? As I was updating our database on listings in Tallahassee, I came across a home for sale with the same listing agent since November of 2012. I got to thinking ... what the heck do they talk about during their weekly phone calls? You know, when your listing agent calls you each week to give you an update on the marketing and what the competition is doing. How exactly does that conversation go? 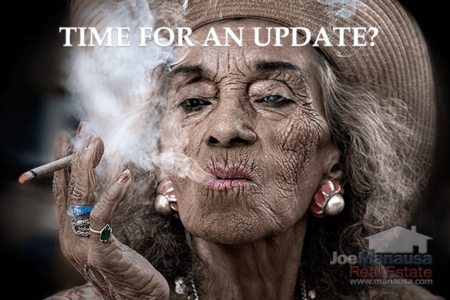 So I dug even further to find out how long each homeowner who has a home on the market today has been listed with their current listing agent, and the results were shocking. Therefore, in honor of the reigning champion homeowner whose house has been listed for sale with the same listing agent since April 2010, I have come up with 10 conversation starters for your listing agent's call. Before we get to the 10 ways to engage with your listing agent, let's first take a look at how bad the problem really is for some home sellers in the Tallahassee real estate market. Would it surprise you to know that there are hundreds of homes that have been on the market for more than a year ... with the same agent? Seriously, unless your home is valued within the top 1% of the market, how is it that you are still trying to sell it (doing what did not work in the past)? The real estate graph below shows current listings on the market today, arranged by the date they hit the market with their current listing agent. Considering the median time on the market for homes that do sell is 57 days, there might be a problem for many of the owners of the houses for sale in the Tallahassee MLS. Here are ten questions you should ask your real estate agent when it becomes apparent that your home is not going to sell. Sellers most-often get the best price when their home sells right away, so I wouldn't let too many weeks go by (let alone months or years) without having the discussions below with your listing agent. Can You Tell Me The Liquidity For A Home Like Mine Today? How many homes (like mine) are on the market today? How many homes (like mine) will sell this month? What Recent Sales Were Most Like My Home? Have any of people who have seen my home purchased something? If so, what did they buy? Show me my neighborhood home value trend. Show me my neighborhood home price trend. Show me all recent home sales in my neighborhood. What daily activities are being done to sell my home? What do I need to do to procure a buyer in the next 4 to 14 days? If your home has been on the market for more than a few weeks, then you should start these questions right away. If there exists ample liquidity in the market for homes like yours, there is no reason that your home has not been selected by the current buyers in the market, right? After all, if (for example) ten buyers are going to make a decision to purchase a home like yours this month, and your home is one of the best ten deals among the similar homes for sale, why wouldn't they choose your home? If you would rather avoid having to resort to a long-term relationship with your agent, the best solution is to take the time to interview real estate listing agents for the job of selling your home. Do your research. Remember, 94% of homebuyers are using the internet, so make sure you hire somebody with an excellent internet marketing plan for selling homes. If you are considering selling a home in Tallahassee, we would love to interview for the job. You can drop me a note anytime to get the ball rolling, and we'll make sure you know that your listing agent knows how to get your home sold right away!